A new Kickstarter-born startup by the name of Jide Tech launched a mini-PC that uses a beautiful custom version of Android. Powered by Remix OS, Remix Mini allows you to work and play with the entire Android app ecosystem while taking full advantage of intuitive PC features such as a taskbar, multiple window multi-tasking, mouse and keyboard support, and so much more. Remix Mini is powered by the latest 64-bit chipset and delivers up to 20-30% better performance than its 32-bit counterparts. At the core of what makes this so special is actually what Remix Mini doesn’t need you to do. You will never have to worry about whether you’re installing the right bit version ever again. With Android, it all just works. The typical desktop computer clocks in at anywhere between 65 to 250 watts. Remix Mini gives you the same power of desktop computing at a mere 10 watts. By simply leveraging already existing power efficiencies found in mobile CPU architectures, Remix Mini is able to save you so much more in power without sacrificing anything in performance. Thus, it reduces your monthly power bill. Save power & save environment. Remix Mini comes equipped with everything you need in order to stay connected: WiFi, Ethernet, Bluetooth, and USB. All of these options give Remix Mini an unprecedented level of versatility in a variety of scenarios. 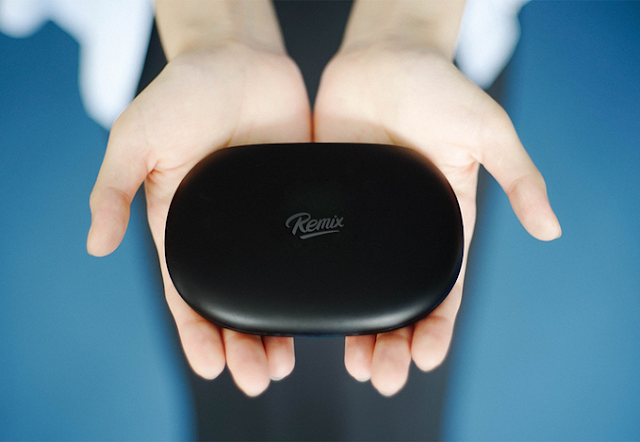 The 1GB/8GB version of Remix Mini goes for $20 (Early Birds, all gone) and $30 (unlimited), while the 2GB/16GB version is going for $40. Both ship worldwide, but the fee varies between a reasonable $15 and a rather expensive $30. So far, the project has easily exceeded its $50K funding goal, reaching $500K, with 40 days left.